John Boehner held a press conference Thursday, at which he accused President Obama for “just not being serious about cutting spending.” It’s about time. Republicans are being hammered in the court of public opinion, and they have only themselves to blame. 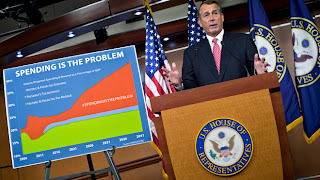 Americans are sick to death of political bickering, and want to see a deal done to avoid the fiscal cliff. Most people think a tax hike on the wealthy is part of a reasonable approach to narrowing our budget deficits. Republicans bucking this popular notion continue to drag out the tired arguments about hitting small businesses where it hurts; most people don’t imagine that the local barbershop is in the top one percent – and they’re right. 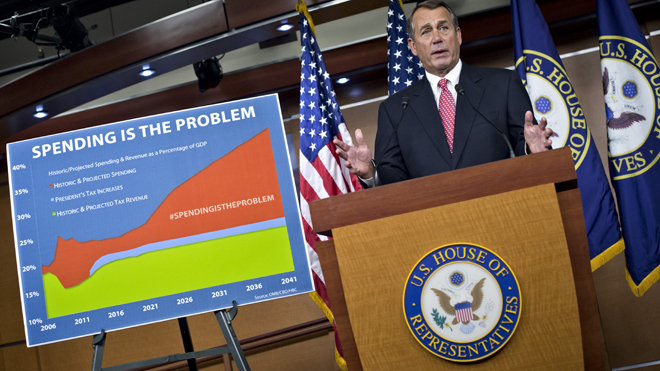 Here’s what the GOP should be talking about: our ever-increasing spending. For the first two months of the current fiscal year, federal spending is up 16%. No one has broadcast that figure -- and it is a stunner. Because spending is up more than revenues, which have climbed 10 % so far this fiscal year, our budget deficit is higher – by 25% -- than a year ago. That’s right—higher. Even as President Obama claims to have cut spending. Republicans need to tap into America’s innate conservatism, and they have failed to do so. Imagine: our budget deficit for the first two months equals $292 billion. Not long ago, Americans would have swooned over that much red ink. In fact, our annual deficit has exceeded that amount only eight times in our nation’s history – and four of those have been under President Obama. Americans don’t like deficits; they consistently rank as a top priority reining in spending. Voters know that we are borrowing heavily – one of every three dollars we spend – to finance our red ink, and in the process debasing our dollar. They know the Federal Reserve is spinning out new money at an unprecedented rate to keep the ship of state afloat; that institution now has a balance sheet of more than three trillion dollars. They are unhappy that our federal debt now tops $16 trillion – and that President Obama is now demanding free rein to raise our debt limit even further. They know it is only a matter of time before some investor, somewhere, decides that the U.S. is no longer the best of a bad bunch, and starts demanding higher returns on his loans to Uncle Sam. Republicans need to tap into America’s innate conservatism, and they have failed to do so. They have allowed President Obama to tag them as the party of “no” -- weapons of mass obstruction. It’s time the GOP got some new talking points, and told Americans the truth about our budget and this White House. During the election, the back-and-forth between Mitt Romney and President Obama became a bewildering swirl of facts and figures, with both parties denouncing the other for misleading the public. Both candidates very nearly accused the other of lying. The truth is that budget projections are based on myriad assumptions and projections; the data is confusing. Here’s what is not confusing: the record. Had the GOP focused on what Obama has actually spent, and not on his fanciful visions of the future when mythical cuts to Medicare (which really are poppycock) and to other programs take hold, they would have scored higher. As it was, a newly cynical public got bored and tuned out. What voters remembered was that Obama pledged to go after the wealthy – and not them.